Although not officially named an Asian Restaurant Row, Convoy Street between the 1-52 freeway and Mesa College Drive surely fits the bill for authentic Asian cuisine. Here you’ll find fabulous Vietnamese, Japanese, Korean and Chinese culture and cuisine in an amalgamation of flavors, sights and sounds. 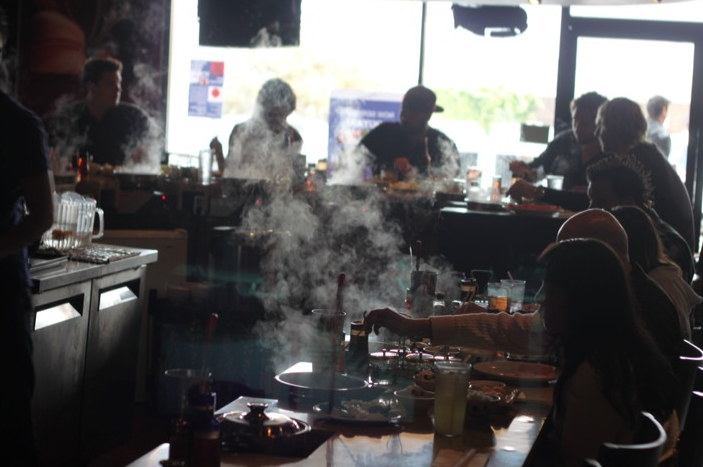 Savor authentic Asian food at Shabu Shabu – where you cook the food – just the way you like it! Convoy Street is lined with wonderful restaurants, shops and bakeries; some of my favorite spots to nosh include Shabu Shabu House, where you cook your own meats and vegetables and dip them into delicious dipping sauces, and Tofu House, where kimchi and Korean hot pots filled with tofu, meats and seafood are the specialty. For dim sum try Emerald Restaurant, which specializes in Seafood dim sum and for great Vietnamese, try Pho T Cali just West of Convoy Street on Clairmont Mesa Blvd. If you’re craving Ramen, Tajima Ramen House and Yakitori Yakyudori & Ramen, both on Convoy are delicious. Yakitori Yakyudori & Ramen on Convoy Street is a local favorite! If you like to mix and mingle with the locals, try one of several Asian markets in the area. The brand new Zion Market features a tasty Korean indoor food court as well as a French-Asian fusion bakery complete with cronuts on the weekends. A little of the beaten path for visitors to San Diego but well worth the effort, Convoy Street is sure to satisfy any craving for Far East cuisine. What is your favorite Convoy eatery? Let us know below or tweet us @VisitSanDiego! This entry was posted in Insider Tips and tagged asian, asian food, asian market, Chinese, Japanese cuisine, Korean, Vietnamese by Kathleen. Bookmark the permalink.